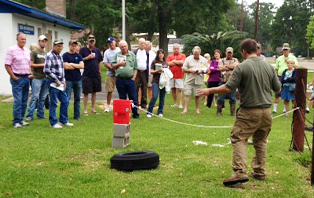 A demonstration of trapping techniques by Mark Tyson, Texas A&M Agrilife. 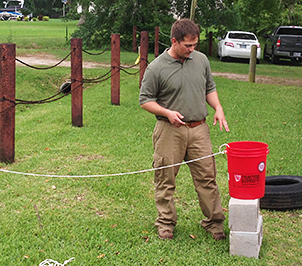 First came what could go wrong with your septic system, then coping with crawling, itchy bugs and on Saturday, April 26, how to control wild pigs (feral hogs) that are causing damage to your property. Thirty-eight participants attended the third in a series of six educational programs hosted by the FOR Environmental Committee. Mark Tyson, Texas A&M Agrilife presented the program. Stay tuned for the last three programs to be advertised in upcoming months.